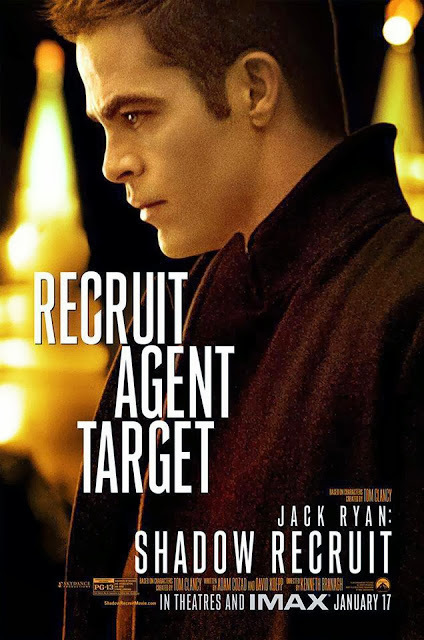 Chris Pine is the new Jack Ryan in Kenneth Branagh's upcoming action thriller Jack Ryan: Shadow Recruit, based on the popular Tom Clancy novels. Pine's Jack Ryan is a CIA analyst who unwittingly discovers a Russian terrorist plot and is sent into the field to continue the investigation. Chris Pine, is the fourth actor to take on the titular role of the CIA Operative (following in the footsteps of Alec Baldwin, Harrison Ford and Ben Affleck), The film co-stars Keira Knightley, Kevin Costner and Kenneth Branagh. His films include Just My Luck, Blind Dating, Smokin’ Aces, This Means War, People Like Us, Rise of the Guardians and Star Trek Into Darkness. You’re following in the shoes of Harrison Ford, Ben Affleck and Alec Baldwin. How did you make the role your own? I think I make the part my own simply by the fact that I’m in it so there are certain things that I bring to it that are different. I watched the films and enjoyed them growing up and I really like the spy genre. What I loved about Harrison is that he has an intrinsic humility to him that I think he brings to everything he does, whether it’s Clear And Present Danger or Patriot Games, where Anne Archer drives a Porsche and he has a Volkswagen Jetta and he has a tweed jacket that he seems to have had forever and I just loved that. I did this movie called This Means War that was all about a man in great suits who wants to be the James Bond type of spy and if you see some of the suits I wear in this you’ll know that Jack Ryan is not a man interested in threads – he would much rather go to a first edition book store. So I always loved that humility of Harrison and with Alec Baldwin I just love that kind of sharp, incisiveness he brought to it. He was like a razor in terms of his ability to cut up information and put it together and process it. And I loved that in The Hunt for Red October, in order to avert nuclear catastrophe, he had to figure out the mind of one man and it all came down to this man missing his wife. So there was a psychology to it I really liked. And I think what sets our film apart is that there is great action in this film and when Ken and I started, we talked about how often in films you see so much death and mayhem and violence and no one ever really pays attention to it – you know that a bad guy dies but he maybe also had a wife and a kid but you don’t know his background. So we thought it would be interesting to see the face of that part of the experience. What happens when an everyman is thrown into an extraordinary situation where he has to do things that you wouldn’t necessarily do on any given day and how does he deal with seeing death? How does he deal with inflicting violence? How does he deal with potentially killing someone? And I thought that was really interesting because I can’t recall where you see that happen in films of this genre; where you see people killed but you never see the effects of it. So I like that human aspect it has. I came to the UK last year before we started shooting and Ken organized some things for me. We went to the American Embassy in London and we had this little spy game to do, which was a lot of fun. It’s known as a ‘drop’ in spy parlance and the whole thing was like being at spy camp. Ken was really proud of himself and he was like, ‘I’ve organized a little something for you Chris...’ and then we ended up at the American Embassy and the security team there were in on the plan. I had to find the people that were watching me and there was a drop at one point where I had to pick up a memory stick and do all kinds of stuff. It was a fun but as fun as it was even in that scenario, when you know that there are people out there watching you, your senses are immediately heightened and your heart starts to race. Did it give you a taste of what it would be like to work for the CIA? Yeah, and it certainly did that (laughs). And I obviously wasn’t in any danger so I can only imagine what people, real operatives, have to deal with. Did you talk to any real CIA agents? I talked with a guy there who was the head of security at the Embassy in London, which is the biggest Embassy in Europe, and his stories about being in Beirut were just crazy. And it’s often less about the stories but more about the energy you get from people like that. I talked to Bob Baer and he’s written a couple of books and he was in the CIA and being around someone like that was really helpful and his stories are great, too. It’s all about the energy that people put out in the room. Jack has been injured at the start the story. Did you do any research into that? Jack Ryan has suffered a major back injury and he has to recuperate I went to a facility outside of London where veterans are recuperating from major traumatic events from Afghanistan and Iraq and I got to talk to some of them. And again, we were bringing it back to the facts – if you are in a helicopter crash, what does that mean? It’s major and traumatic and if you see violence and death and all sorts of horrible stuff, that has an effect on you. And it’s the idea that this is a man who is wounded, like any of us would be, psychologically as well as physically, but he still wants to serve. And I met many people who were gravely wounded and still wanted to serve. And I wanted to get my head around that because I am certainly not that courageous. I wanted to understand what that was all about and that was a real eye opener. 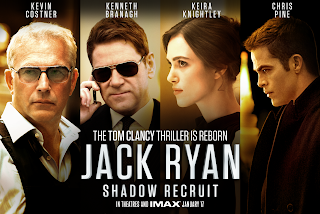 Does it make a difference that Kenneth Branagh is also acting as well as directing Jack Ryan? What’s nice about working with an actor/ director that there is an understanding of the experience of the actors. Ken knows intrinsically what you are going through and what you may need at any given moment because he’s been there himself. And there’s a level of communication that’s better and easier often than with someone who hasn’t been an actor. Ken knows the experience and how it needs to be said to get across for me to achieve what he is looking for in a scene. And then he also brought things to it that was purely down to his talent as a director. This is a big action film and we were shooting relatively easy 11, 12-hour days and that just comes from Ken not over shooting it. Ken would have three cameras and he would block it off and we’d finish a three or four page scene in a day or less, which doesn’t happen very often and I like that. So I think with Ken, a lot of it is the way he communicates and a lot of it is has to do with his talent as a director. 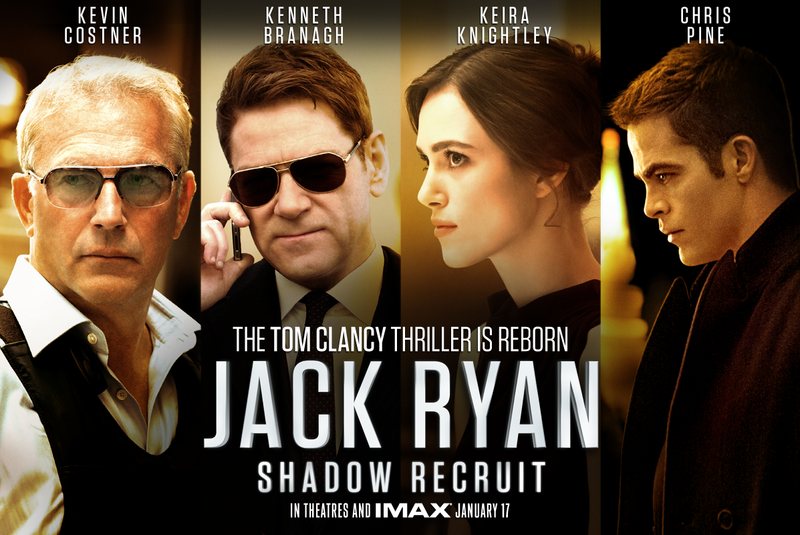 Were you a fan of Tom Clancy’s Jack Ryan novels growing up? I was born a fan of the films, that’s what brought me into the fold, and then I read some of his books. And did you get the chance to meet Tom Clancy before his passing? Sadly I didn’t know the man at all but I’m playing a character that he created that I love and I’ve loved for many years and I’m thankful that I have this opportunity. I wish I’d had the chance to meet him. My thoughts go out to his family. How close do you think your character, Jack Ryan, is to reality? We talked to people like Bob Baer who was an analyst with the agency for a while, and not only are the tricks and gadgets we use in the film very real but that this kind of thing – the financial terrorism that is a big part of our story – is very current. As we all know, we are in a new world where warfare and terror takes on many, many different forms and the financial system is so complicated as it is that you would need a PhD to figure out what is going on. But Jack has one. It’s really scary. It starts with a bank and goes beneath a bank and I think it is based in reality but hopefully this won’t happen. You could argue that a good spy thriller has to reflect the time in which it is made and the Jack Ryan books have changed according to the time. Was it important for you that the film reflects the geo-political reality of our times? It was of the utmost importance to me and I can’t tell you how many conversations I had with everyone involved. For me, the question always came down to what it meant to be a patriot because Jack is a patriot of sorts. And my contention was that in a post 9/11, era the world is much grayer than it was 25, 30 years ago. With the Cold War, there was a kind of easy black and white, much in the same way we view World War II, there was good and there was bad and it made life a lot easier. But it was different after 9/11 and I wasn’t interested in making a film that was about espousing the ideals of America or that America was great. For me, it was like watching what Harrison was about when he did the role, that this wasn’t a man that was tied to ideology – this is a man with a great internal moral compass who knew what right and wrong was. It’s a man who would stand up for what was right and I love that. I love the fact that he has an internal flag, that’s what he goes by, and if it meant disobeying, he would do that. And I always think that’s a definition of a hero that we all connect to that more than anything else. Once I found an inroad into the character, it made a lot of sense to me and I thought if we could make a film about an American spy post 9/11, a spy who is a good man but conflicted about what he has to do and he wanted to make sure he was serving on his own terms – I could understand that and I felt comfortable with it. The spy genre has produced some great films and some enduring characters – James Bond, Jason Bourne for example – what will Jack Ryan bring to the audience? I would say that James Bond has Q, Jason Bourne has his fists and Jack Ryan has his mind. And it’s about a regular man, albeit a smart man, who is way more comfortable in the world of his mind, in the world of the intellectual puzzles that he likes to figure out, who finds himself inextricably pulled towards the front line. Jack Ryan has a great amount of intellect and he has to find his way out of very dangerous physical and intellectual situations. It’s about a man who has to deal with all of this stuff that we know to be a part of the spy genre like death and intrigue and it’s about how a man like that deals with committing violence and protecting the people that he loves and all of that affects who he is and he doesn’t do it easily.